Before I lost my hair, I very rarely wore any makeup. I liked a very natural look and just didn’t feel like I needed or wanted it. But after getting alopecia universalis, everything changed. When one loses facial hair as a result of having alopecia, makeup becomes a very important aspect of looking and thus, feeling “normal”. Without eyebrows and eyelashes, the face becomes a blank canvas. Brows express emotions while the eyes are the window to the soul. It is well worth your time researching the best ways to replicate what nature originally designed for your face and in some cases, improve upon it. After finding your best hair replacement, having nice eyebrows will make a huge difference in helping you accept your alopecia. It’s so much easier when you can smile at that image in the mirror. Because you’ve asked, I will describe in detail my process, but please consider this a template for you to further experiment with until you develop your own technique. I highly recommend making an appointment with a good makeup artist. Explain that you have alopecia and need to recreate the facial hair that is missing and play up your best features. A reputable department store or salon will welcome the challenge to create your beautiful face. Educate yourself by reading a good book like Bobbi Brown’s Living Beauty or her latest, Makeup Manual. I became a huge fan of Bobbi’s way of looking at beauty. She has a very natural and timeless style that looks great on everyone. Her site, bobbibrown.com provides a 5 minute routine that can range from minimal to dramatic. Concealer is a must at any age and can work wonders for older skin with darker areas that need lightening like under eyes, the upper inner lid area, the corners of the nose and mouth and any spots. I’m currently in love with the Amazing Cosmetics Concealer. Foundations offer all kinds of options with SPF and semi-matte finishes. They smooth out the complexion and provide a seamless palette for whatever is to come. 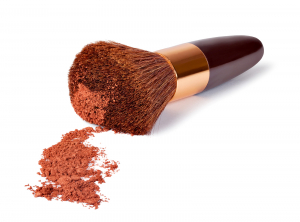 Blush color always had me stumped until I found a powdered bronzer that doubles as a blush. It sculpts the sides of my face and gives me a healthy glow without adding any particular color. Sometimes I will use a hit of pink on the apples of the cheeks just to makes them “pop”. Play up your eyes and lips with liner! I recommend a lid foundation or cream shadow that does not migrate into the lid crease. Bobbi Brown makes a Long-wear Cream Shadow that you apply with a wide, flat brush. This could be enough to accent the lids but I usually like to add a darker contour color in the crease and the “v” at the outer corner of the eye. A small angled brush works nicely for this effect. Eyeliner is VERY important because most of us have no lash line and we need the eye definition. Eyeliner will automatically make your eyes appear larger as well. But the key here is to find a liner that stays in place throughout the day and into the evening. My favorite is Bobbi Brown’s Long-wear Eye Gel – I like sepia ink. It comes in a little glass jar and you apply it with a small flat brush. It tends to dry out before it is used up so I just add a touch of eye makeup remover to the pot to thin it out. Use your brush to mix up a tiny area. My last trick to add drama to the eye (and erase any sign of the white lid where hair is NOT growing, is to line the inner eye lid with a brown or black soft pencil made specifically for this purpose. If you are feeling like going all out, then apply false eyelashes. This is a case where the time you take to practice will pay off in the end. With the right lash and adhesive you can do this in a few minutes! Ultimate Hold Eyelash and Eyebrow Adhesive is the absolute best. You’ll have to experiment with the lashes, but I have been using Cheryn International’s “My Lash” in Sultry/ Charcoal. They are holding up really nicely! Nothing feels quite as feminine as having long eyelashes – after having great hair, of course. With black lashes you will never need to use mascara (my choice). I suppose if you want a very natural look and aren’t wearing much eye makeup, brown will be the right color. After applying a lip plumper (or moisturizer) and a lip liner, my choice for lipstick is MAC’s, Twig, because it is a warm neutral color that goes with everything. I love topping it off with MAC’s Lustreglass in Beaux. I finish with Amazing Cosmetic’s Powderset applied all over the face with a large brush to set everything and keep the shine at bay. My skin tends toward the oily side, so you may have a different problem and need to adjust this. Each of these solutions are worthy of a trial period.